New backdrop window with support for basic patterns. New digital clock in the Workbench title bar. Window scroll-bar arrow gadgets were now grouped together in the bottom right-hand corner. Disk icons moved to the left-hand side of the screen. Removal of the 'fuel gauge' from disk/volume windows. In early 1.4, the Preferences icon used an Amiga 2000 image instead of an Amiga 1000. Startup 1 screenshot is courtesy of Janne Siren and the Finnish Amiga Users Group. It is of a 1.4 ROM-equipped Amiga 3000 after it was booted from a floppy "installed"
on an Amiga 1200; hence the Workbench 40.42. 3D window scroll bars closely resembled the "New Look" scroll bars in Workbench 3.0+. Kickstart 1.4 is actually a special version of Kickstart which loads the real Kickstart from a file called DEVS:Kickstart. Kickstart V2.04 was available as a ROM, or as a disk-based version for use with Amiga 3000s which had Kickstart v1.4. Amiga 3000s fitted with Kickstart v1.4 cannot use 68040 or 68060 processors, regardless of what version of Kickstart is eventually booted, because it relies heavily on the integrated MMU in the 68030 which varies to some degree from the MMU in 68040 and 68060 processors. Unlike most Amiga models, the A3000 supports both ROM-based Kickstarts and disk-based Kickstarts; although not simultaneously. An anonymous Amiga user shares some very interesting developer comments of Workbench 1.4 (Alpha 15)—see Workbench screenshots 7-11. Peter Cherna (former AmigaOS team member) explains the background and changes of Workbench Beta 1.4 through Workbench Beta 2.04. One of the apparently first reviews of Workbench 1.4 was by ORLANDO of Brainstorm. 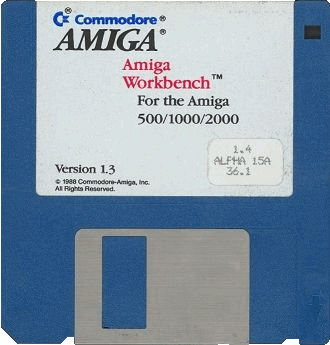 Alpha test versions of Workbench v1.4, the operating system for the Commodore Amiga, have begun shipping in the U.S. As with all alpha-test versions, specifications are subject to change, but the new Amiga operating system has been dramatically redesigned to allow true multitasking, as well as the ability to view all filetypes, not just those with .info suffixes. Also included is virtual memory support, a feature often seen on the Apple Macintosh. Thus, if you attempt to run a package that needs more memory than is on your Amiga, Workbench v1.4 will start saving the unused areas of memory to disk. When the areas of memory are required again, Workbench v1.4 saves the current memory segments, loading the old memory back in. Other features of v1.4 of the Amiga operating system include extended font support, including scalable, outline, and colour fonts. Don't hold your breath on Workbench v1.4, however, as sources close to Commodore UK suggest that a production shipment of Workbench is not due for another six months. Support for the enhanced custom chips. Support for monochrome hires monitor A2024. Expanded library of DOS calls. More math library enhancements, including single-precision IEEE. And, of course, many bugs fixed. Holger Kruse posted on comp.sys.amiga.misc on September 11, 1999: "... V36 only contained an extremely incomplete implementation of dos.library. Lots of calls were added for V37, so programs need to be able to distinguish between both to avoid crashes." Matthew Garrett notes "If there was a missing font/device/library, instead of just failing, a requester would pop up with several options: Retry, Check Drive, Check All Drives, or Cancel. The 'Check All Drives' was the fun one, since it then scanned the fonts/devs/libs directory on every other drive to see if it could find the file—very handy on a floppy based system when you didn't have room for diskfont.library v37 or something. Other than that, the main interesting features were green recoverable alerts rather than amber ones, as well as a 2.0-style bootmenu that managed to be different to the one in 2.01 and 2.04." Hold down both mouse buttons when you power on. You will get an OS 1.3 / OS 2.0 selection menu. Select neither! Instead, move your cursor to where the window's close gadget should be (upper left) and click it. Christian Stich notes that the use of a ROM tower in the Amiga 3000 was independent of the ROM used (1.4, 2.04, or 3.1). He adds that his Amiga 3000 Rev. 8.9 (for all intents and purposes equal to a Rev. 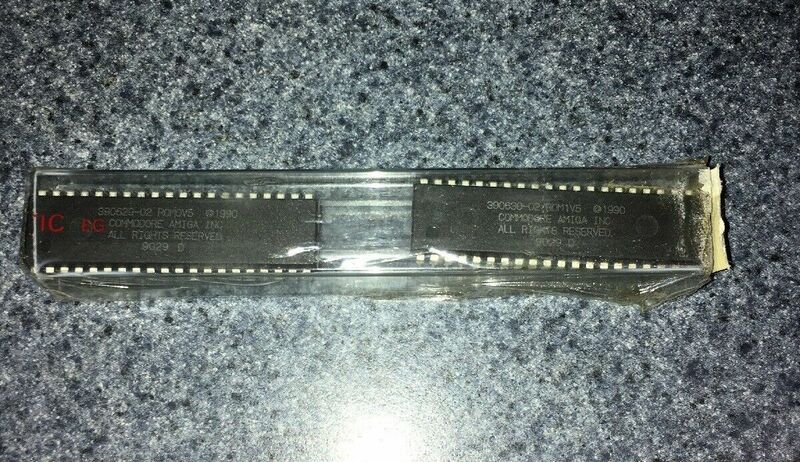 9.3) came with the 1.4 boot ROMs, but now has 3.1 ROMs as he installed a 68040. The ROM tower was used on early Amiga 3000 motherboards to change from a ROM layout to an EPROM layout (there might have been very few ROMs with ROM layout, but most of the ROMs—including his 1.4 ROMs—used the EPROM layout). 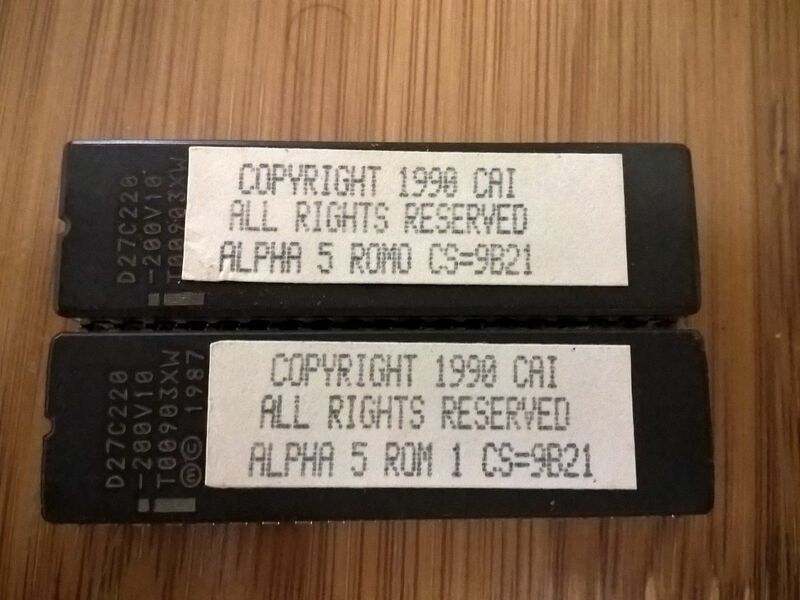 Amiga 3000 1.4 ROM Alpha 5 (Part Numbers: (photo 1 | photo 2) 390629-02 ROM0V5 ©1990 (32-bit Low Word, ROM 0 Alpha V5), 390630-02 ROM1V5 ©1990(32-bit High Word, ROM 1 Alpha V5). Brian of amiga.org notes that "I have a Kickstart.rom file rev 36.022 from an A3000 which is an "Alpha18" version."